Does your housing situation not allow open flames which makes you sad that you can't burn awesome smelling geeky candles in your room? Are you unsure if you'll like a particular scent so you don't want to spend a decent chunk of cash on a candle you may not even like? Do you just prefer using melts over candles? NEVER FEAR! Wax melts are here! Each melt is filled with 2 oz. of our fragrant all-natural soy wax and comes in 6 cubes- that way you can pop out however many you want to use at a time and keep the rest for later! Also, the melts for our layered candle come with two cubes for each layer so you can smell the different scents without having to wait for each layer to melt to get to the next! Wax melts are affordable, small and easy to store, and safe to use in places like dorms (as long as they're okay with melters). Plus you'll only pay $10 for three melts! You can mix and match to your hearts desire! 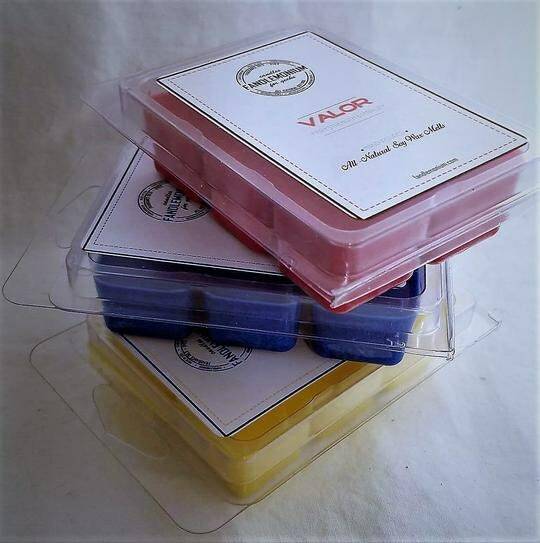 And here's a fun fact- if your order consists solely of wax melts (up to 5)- you'll get free shipping! Just pick whether you want just one melt or a pack of three and then in the order notes specify which character(s) you'd like melts of.